Butterflies and Dragonflies Walk: June 21st. Rhi Bevan, the Water for Wildlife Officer, led a 15 strong party of insect watchers on a walk along the Swansea Canal on a lovely Saturday morning in June. Because of these now regular walks and talks we are beginning to get a much more focussed and organised view of exactly what lives and breeds on our beautiful canal. We learned last month that we have at least four species of bats on the canal. Now we have some idea of the kinds of dragonflies, bees and butterflies that use this green corridor. Firstly, the dragonflies and damselflies. The common blue, the common darter, and the large red damselfly were much in evidence. The Broad-bodied and the Four Spotted chaser we also seen. 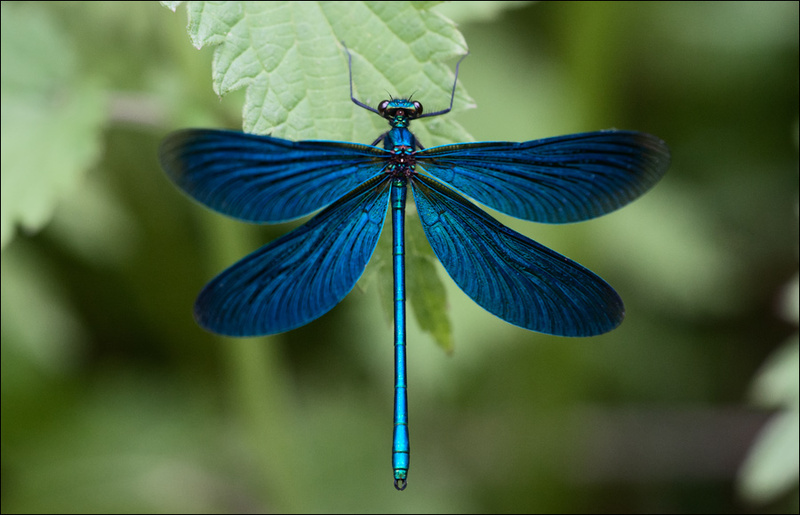 But top of the X Factor list must go to the iridescent blue of the Beautiful Demoiselle damselfly, a stunning sight and one that pleased Rhi very much. Ringlet and the Cinnabar. A patch of nettles near the Mond Golf Course was also the home and feeding ground to many Red Admiral and Peacock butterfly caterpillars. Three types of bumble bee were out and about on the day: the Tree Bumblebee, the Buff Tailed Bumblebee, and the White tailed Bumblebee. We are also pleased to report that honey bees were alive and well on the canal. We know that the waters of the canal are much cleaner these days and this was borne out by another sighting of the brook lampreys which were first recorded on the canal only last month. The graceful brown trout was also seen. Rhi was not so pleased to report that the horseflies that made a meal of her arms are also out on the canal in great abundance. A small price to pay, Rhi.